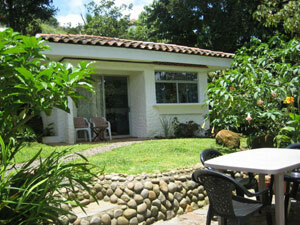 This pleasant small home with guest cabina is located in one of the two most successful and desireable planned communities at Lake Arenal. The community of Las Flores is intriguingly set on a complex hillside overlooking Lake Arenal, its lanes curving and dipping and climbing to houses set among mature forested areas interspersed with sweeping lawns and beautiful planned landscaping. Though the homes are all of a similar Spanish colonial style, there is much variety in size and floor plans from home to home. This small home of 861 square feet is especially suitable for a couple who would like separate quarters for visiting family and friends or would would like to rent the cabina for extra income. 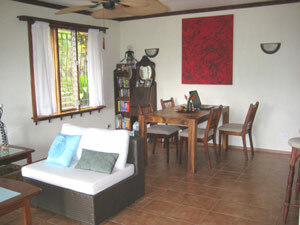 The price includes the furnishings, though the owners will keep some personal items. The house sits high above a large natural pond continuously refreshed by a stream that flows through the community. Because of this and the great variety of flowering native trees and plants that are around the homes, the birdwatching opportunites are constant. 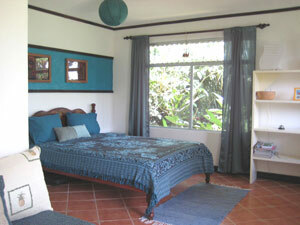 The town of Nuevo Arenal is 10 minutes away.Liberia internationa airport is less than 2 hours away. 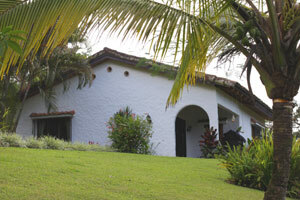 The home is in a secluded landscaped setting out of sight of other homes. 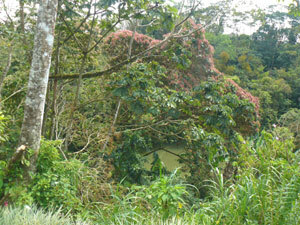 The mature and successful community has wonderful flowering trees amid its forests. 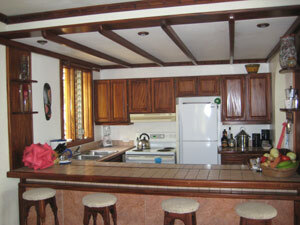 The home has an open floor plan though the kitchen has a dropped ceiling with trim of fine native hardwoods. 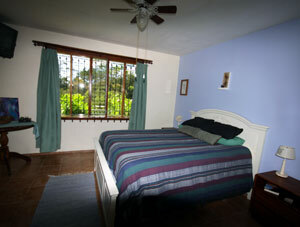 The roomy bedroom has a nice viewof the wooded surroundings. 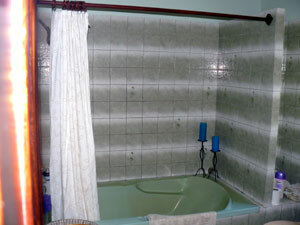 The modern bathroom has a tub as well as shower. 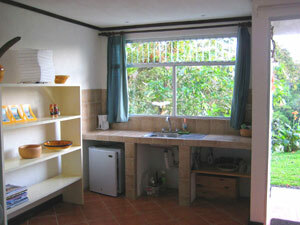 There's also al laundry room. 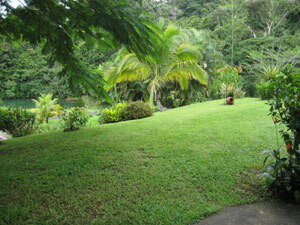 The landscaped grounds overlook a large pool form by a continuous stream. 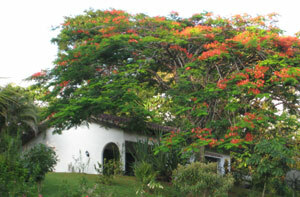 Unlike most gated communities, Las Flores has much natural forest. The cabina has a pleasant private setting. The studio plan is quite roomy. 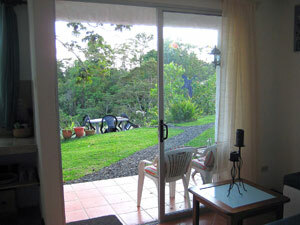 The kitchenette, the sitting area, and the patio have fine forest views enlivened by the wonderfully diverse birdlife of Costa Rica.